The image of ourselves that we present to the outside world is as ephemeral and unreliable as a drug-induced hallucination. 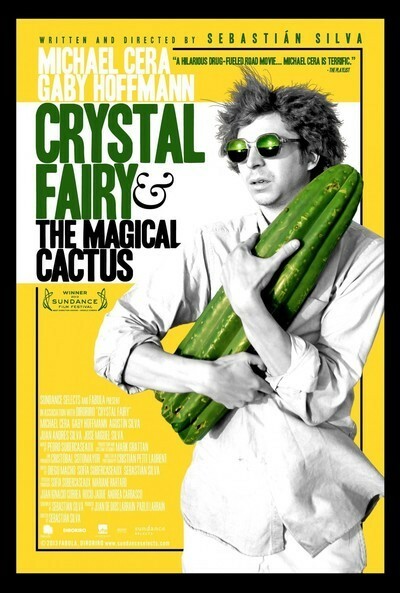 That's the revelation at the end of a long, strange trip in "Crystal Fairy," Chilean writer-director Sebastián Silva's semi-autobiographical, borderline verité depiction of a group of friends pursuing the fabled high of a powerful plant. It's an intriguing, often contradictory juxtaposition, the approach that Silva has taken: telling the story of a wild experience in stripped-down fashion. With hand-held intimacy, Silva shot in sequence as his actors — who range from his own brothers to the ubiquitous Michael Cera — improvised their dialogue from an outline. He was literally along for the ride, but it was a ride he'd already taken. Sorta. The result is a movie that ambles and takes its time, never revealing where it's going. It may seem to be meandering — and you may wonder why you should care about these people and whether they ever achieve their elusive high — but the ending sneaks up on you with a surprising bit of emotional catharsis, thanks largely to a brave, complex performance from former child star Gaby Hoffmann ("Field of Dreams," "Uncle Buck"). Jamie and three of his friends (the director's brothers, Juan Andrés, José Miguel and Agustín Silva) have plans to drive north in the morning to seek out the San Pedro cactus, which is known to contain a potent hallucinogen. But at the party, Jamie blithely invites a free-spirited American hippie chick who calls herself Crystal Fairy (Hoffmann) to join them — then he's shocked when she actually shows up. She's so annoying, you begin to sympathize with Jamie for suggesting that they just drop her off at some random hostel, rather then taking her with them all the way to the beach. But in time, the tide turns — and so does the group's attitude. As Crystal's kindness and vulnerability surface, Jamie's crassness and cruelty become even clearer. Hoffman grows increasingly lovely here: goofy and playful but with an underlying darkness, while Cera's manic insecurity provides a steady source of tension. Each is trying to assert his or her own will on the direction of this journey, and the way in which the tone vacillates reveals the power of the groupthink mentality. Jamie is judgmental and pushy; Crystal is easygoing but just as pushy in her own way. Ultimately, the drug will allow them to share their true selves with the world — the ones they've been hiding behind concocted personalities. It can be a bit of a slog to get to that point, though. Silva's pacing is languid, ostensibly to reflect the rhythms of real life, but that isn't always compelling from a viewer's perspective. And while Silva takes no sides himself, he may be a little too detached. But in the quiet, natural beauty of his surroundings, in the still of the night, his characters reveal an unmistakable humanity.